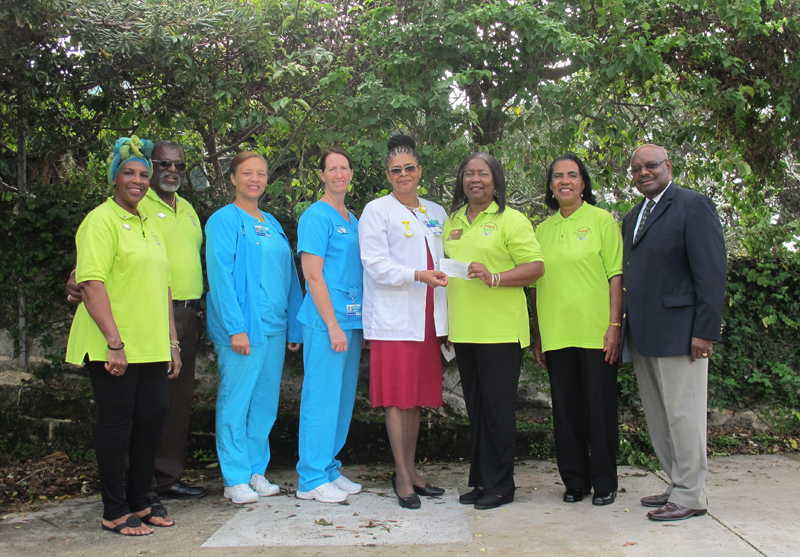 The Kiwanis Club of Bermuda has donated $21,000 towards a new incubator that will be used in the Special Care Baby Unit in the Maternity Department of the King Edward VII Memorial Hospital. Christine Virgil, Clinical Director of Maternal Child, comments: “We are very grateful for this very kind donation. Such donations make a big difference on the front line of care for some of our most vulnerable patients. Photo left to right: Kiwanis President, Sandra Stowe; Kiwanis Past Lieutenant Governor [PLG] and Chairman, David Burgess; BHB Maternity Clinical Manager, Janet Wheelan; BHB Midwife, Lisa Blydon; BHB Clinical Director of Maternal Child, Christine Virgil; Kiwanis Lieutenant Governor [2013 to 2015], Altama Burgess; Kiwanis PLG, Leleath Bailey; Kiwanis PLG, Raymond Tannock. Chairman of Kiwanis,Mr David Burgess said, “The Kiwanis Clubs of Bermuda are extremely proud to support local hospital services, especially those caring for Bermuda’s children and babies. Does KEMH also practice kangaroo care?